SpectroDens is your all-purpose, modern measurement device for every application from pre-press to print. Whether it be in pre-print for verifying proofs, for ongoing quality control at the printing press, during delivery inspection of paper and print products or in a color lab, SpectroDens is exceptionally suitable, no matter which application. 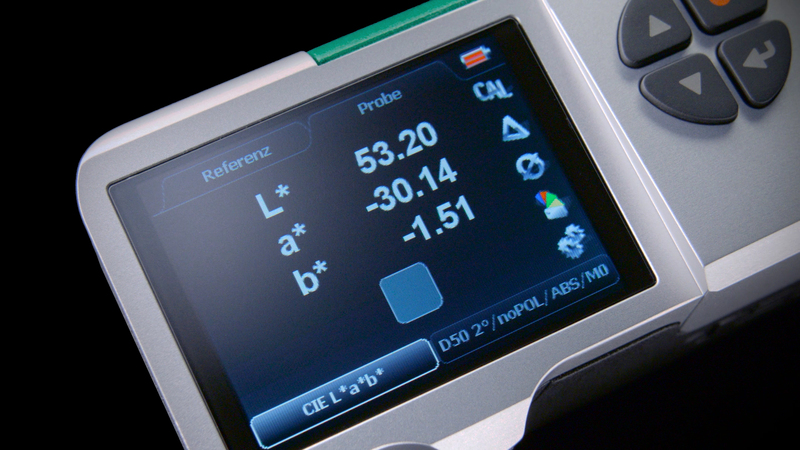 It combines the qualities of a highly accurate spectophotometer and an easy-to-use densitometer. Measurement is spectral, i.e. the entire color information – the spectral fingerprint of the color – is precisely registered. The data is converted into measurement data for descriptive analysis and display. The device works strictly according to the standards valid for the Graphic Industry. It is particularly good at evaluating the Ugra/FOGRA-media wedge because it toggles between colorimetric measurement without polarization filter and density measurement with filter at the push of a button. The supplied Windows-software TECHKON SpectroConnect provides the connection between SpectroDens and the PC via the micro-USB connector or via the optionally available WLAN module. Measurement data can thus be comfortably viewed and processed on the PC.